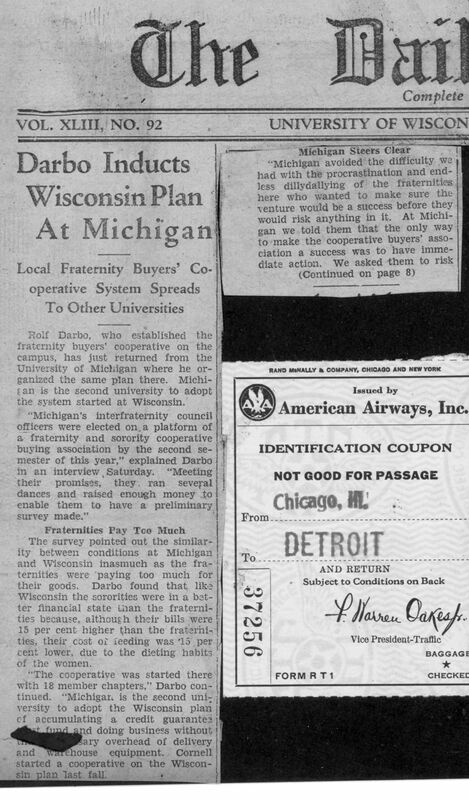 Rolf Darbo, founder of UPMC in 1931/1932 may have also been the innovative director of the Madison Scouts (Drum and Bugle Corps) in the 1940’s and the Madison inventor that lived at 200 North Prospect, presented patent seminars at the UW and passed away in 1984 holding 12 US patents. The following represents that it was created during the terms of James H. Cottrell, manager and Ruth Hintz (assistant manager) which appears to date it sometime between x and y. The author is unknown. 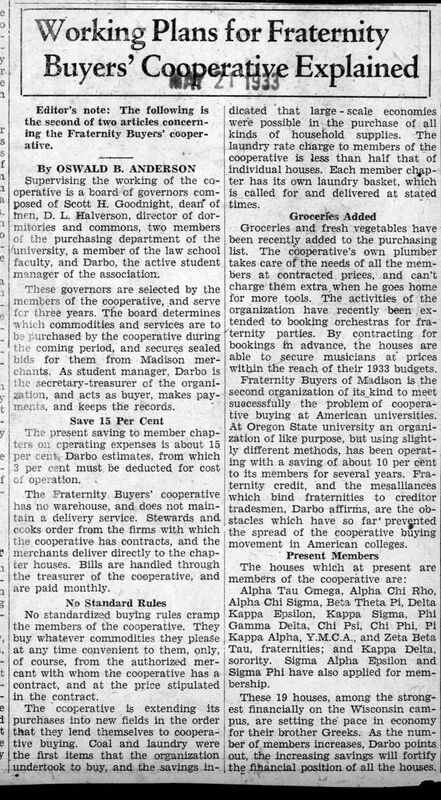 Fraternity Buyers Cooperative was organized in 1932 by the fraternities to pool their purchases of foods and to improve their deteriorated credit relations with local merchants. The pooling of purchases enabled the members to do business with institutional suppliers, thereby gaining significant savings in costs. The principle organizers were Scott Goodnight, Dean of Men, Professor Alfred Gausewitz, Law School, Professor Don Halvorson, Director of Dormitories and Commons, George Brigham, University Purchasing Department, Ray Hilsenhoff, Student Financial Advisor, and Rolf E. Darbo. 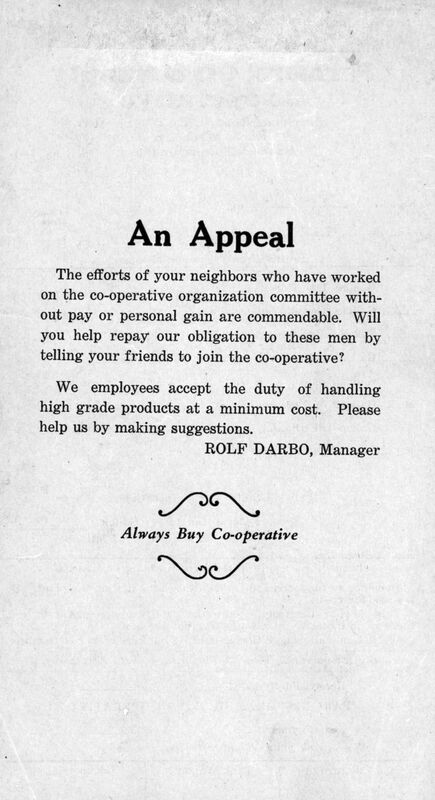 Mr. Darbo, a student at the time, was the first manager of FBC. He is now a Madison business man and inventor and was recently the subject of a Wisconsin State Journal feature article. The charter members of the Association were Beta Theta Pi, Chi Phi, Chi Psi, Kappa Sigma, Phi Gamma Delta and Zeta Beta Tau. Within a short time fourteen additional groups joined the organization. 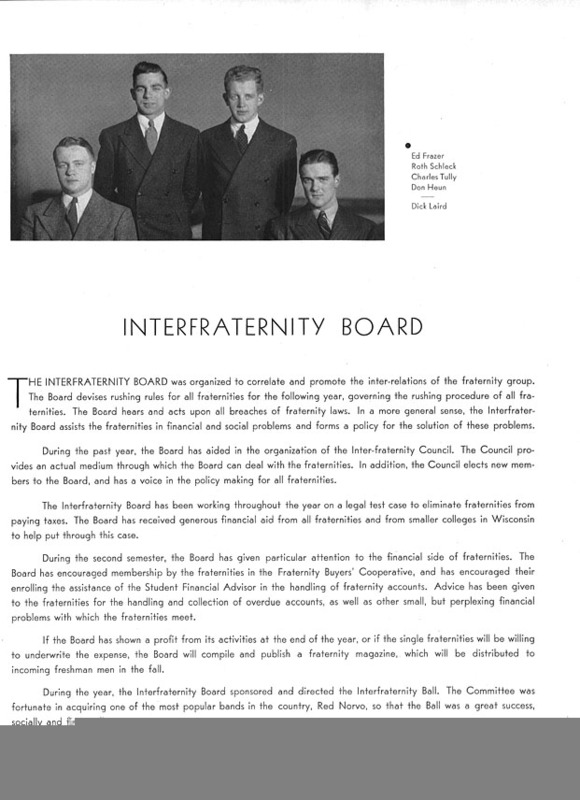 During the Second World War years the fraternities were inoperative and PBC, of necessity, became inactive. With the end of the war, the fraternities again occupied their houses and FBC was reactivated. 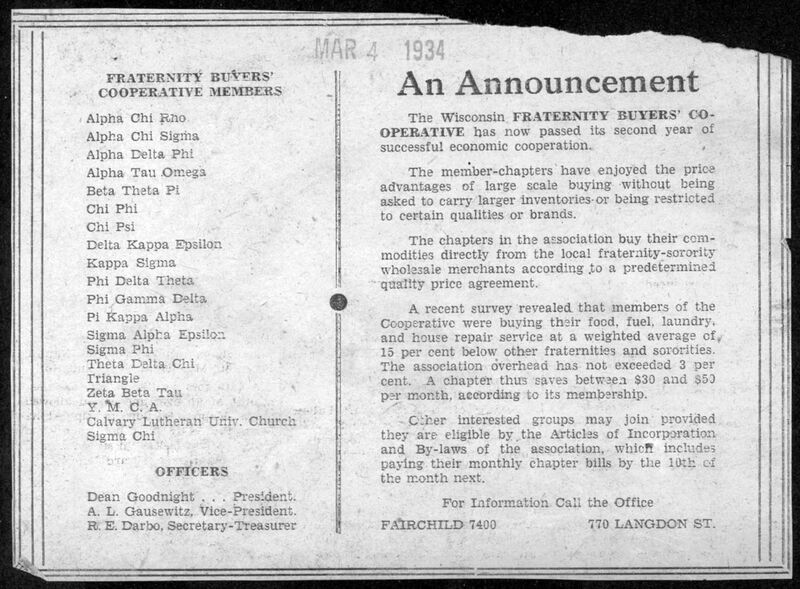 Within a brief period of time all chapters on the campus became members. FEC business was basically in the buying of foods. The savings in costs to members inspired the association to expand into areas of household supplies, food and maintenance services. 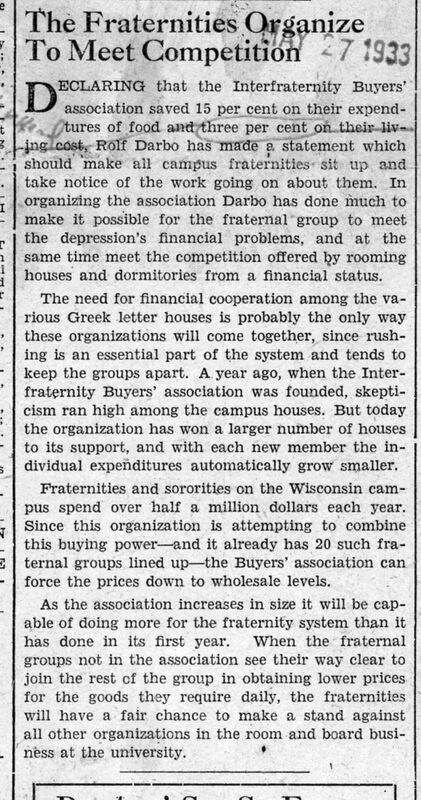 Within a few years the association voted to invite sororities, campus religious centers, and cooperative living groups to become members and to enjoy the convenience and savings of pooled purchasing power. 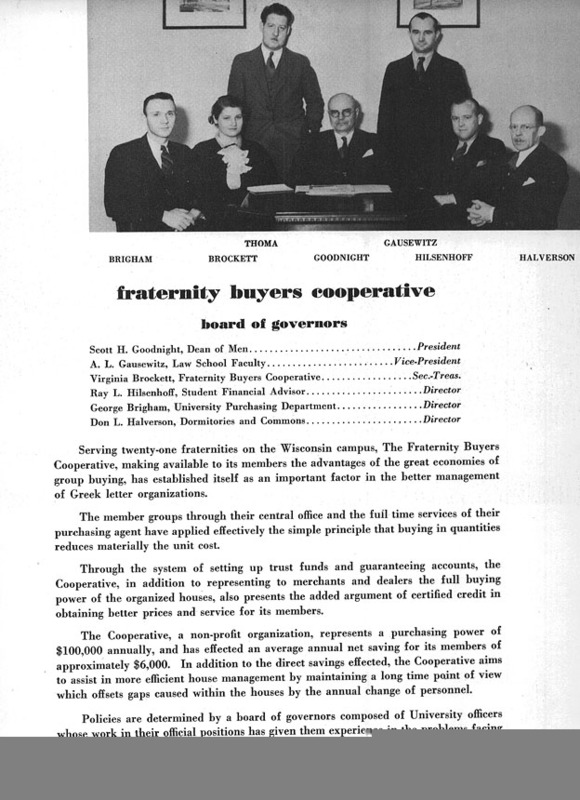 The overall operation of Fraternity Buyers Cooperative is vested in a Board of Governors comprising thirteen persons elected by the members of the Association at the annual meeting. The Board consists of the senior section with seven members and the student section with six members. The senior members are elected for three year terms. Candidates must be drawn from the faculty and administration staffs of the University and from Alumni groups of members. The student section consists of four persons representing the fraternities and sororities and two persons representing the cooperative groups, with terms of office of one to two years. Members receive a comprehensive Directory at the start of each school year listing supplies and services by category. A bulletin is published each Thursday containing information on prices and specials offered by suppliers. From time to time recipes and menu suggestions are included with the Bulletin. At the end of each month, a consolidated billing statement is rendered each member for his purchases. This is of great time saving value to the treasurer, as he need write only one check instead of twenty or more. FBC is a non-profit cooperative and any earnings on hand at the end of the fiscal year are rebated to the members in direct proportion to purchases. 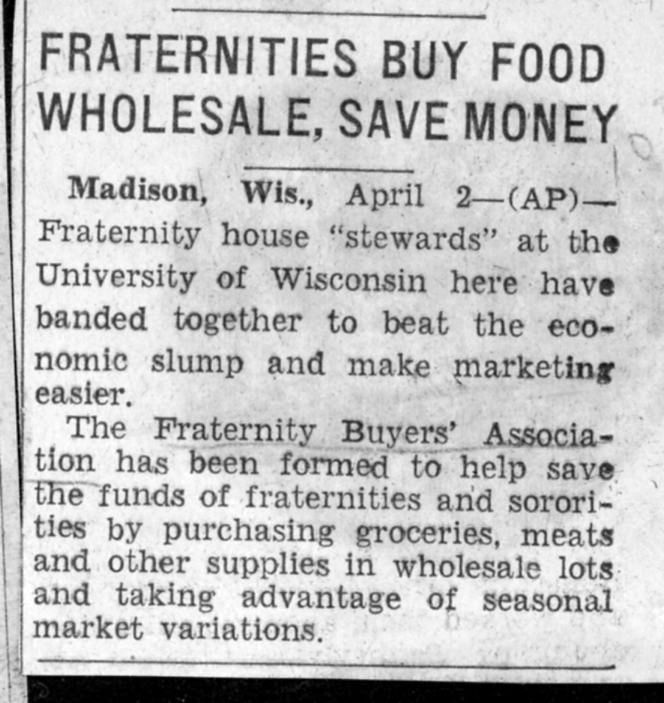 The notion that fraternities and sororities on the Wisconsin campus might someday own and operate their own business enterprise for acquiring supplies and managing fraternal housing floated around in the embryonic stage for more than 30 years before it became a reality in 1932. It was estimated at the close of the 1934 fiscal year that FBC had saved each member house between $30 and $50 per month or approximately 15% less than it had cost non-member houses for living expenses and supplies. The Plague of Mesalliances One of the problems that continued to plague non-member houses which barred them from becoming members of the Cooperative was the misalliance with local merchants. This problem persisted throughout the entire period from 1930 to 1950 and possibly beyond these years. 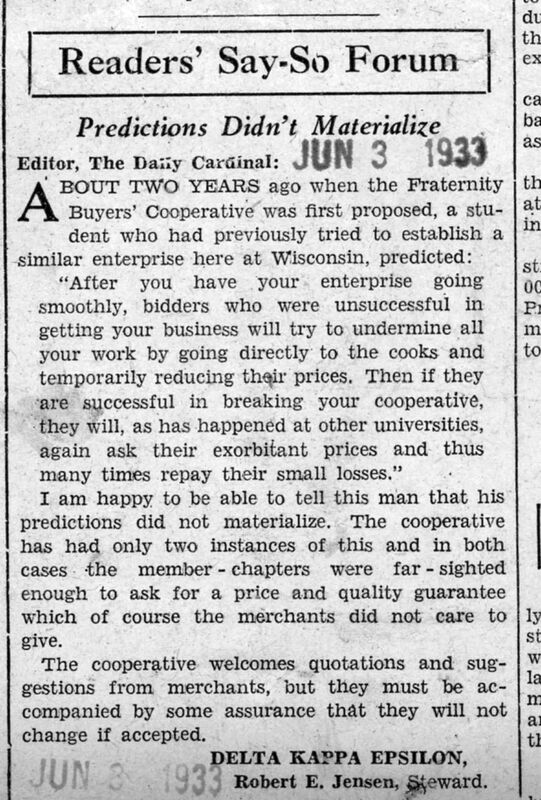 Some fraternities were simply indebted to various suppliers to the extent that they were not free to buy their provisions elsewhere without fear of having their creditors move in and demand settlement of their debts. In retrospect, the first 15 years of F.B.C.’s existence was severely handicapped by at least three factors. Firstly, the organization did not have an adequate structure or sufficient resources to freely guarantee payments to the merchants supplying fraternity accounts. If the organization had had sufficient capital it could have eliminated the mesalliances expeditiously as was done in the 50’s. Secondly, the volume of business transacted during the 30’s and early 40’s with a limited number of members was relatively unpretentious. Thirdly, management was weak owing to the limited income received by the organization. 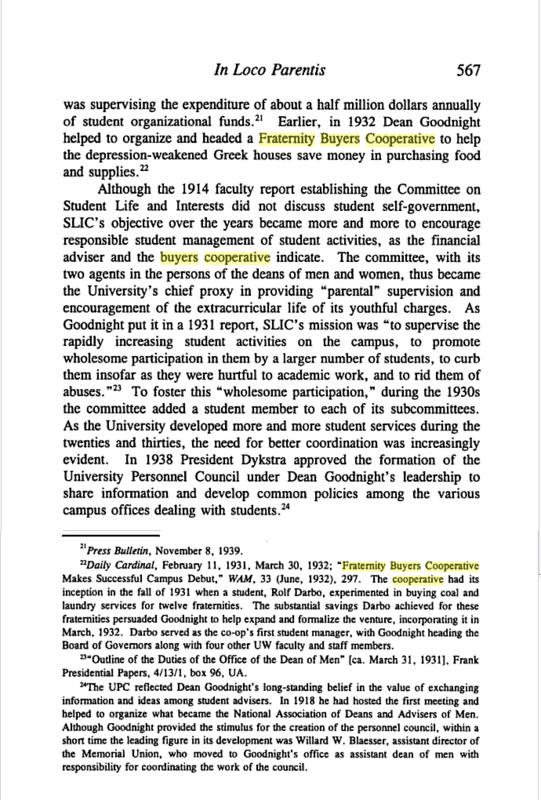 The Board of Governors only employed the part time services of either a student or a housewife who voluntarily came to the business office of F.B.C. at irregular hours on unspecified days of the week. No secretarial services were provided, but the Accounting office under Hilsenhoff’s direction did receive emergency calls. During the years of World War II, the organization became inactive. Many of the Fraternities were closed since so many of their members were in the Armed Forces of Uncle Sam. 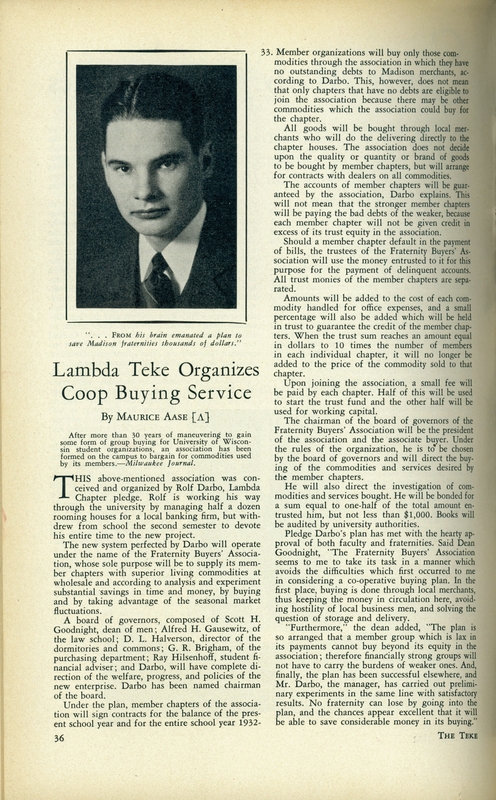 After the War (1940-45), when so many men returned to continue their education, fraternal life on the campus was rejuvenated, and in the immediate years following 1946, membership flourished in all social organizations. Some alumni members had been assigned the task of caring for fraternal properties during the war years, and they were concerned in getting their units back into normal operating order. These concerned alumni appealed to Ray Hilsenhoff to take some action in reactivating F.B.C. 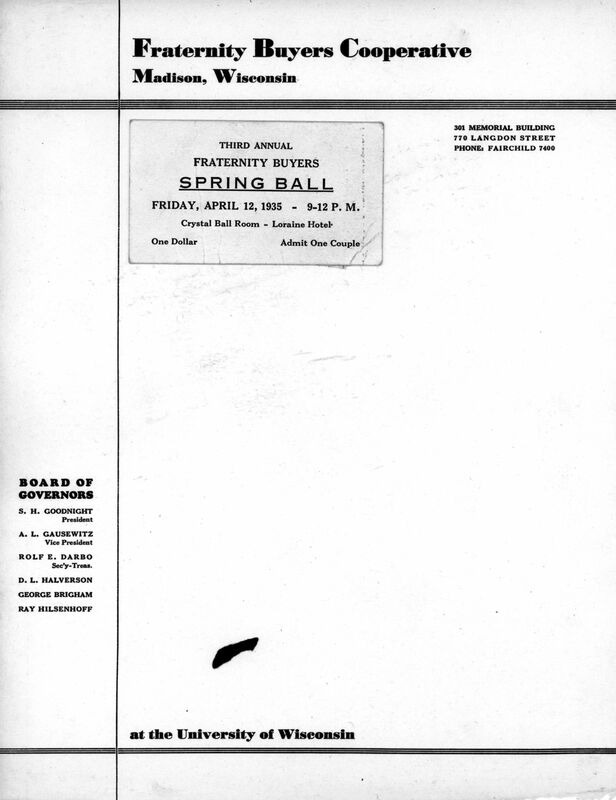 Soon thereafter, Ray encountered Henry Bakken on a street bus one day and suggested that since he was the President of the Board of Governors when the organization went on an inactive basis early in the 40’s, that he should take the initiative and call the the remnants of the old Board together to discuss what steps should be taken to reactivate the organization. As it is recalled by the writer, the following members were on campus: Ray Hilsenhoff, Charles Bunn, Dean Paul Trump, Theodore Zillman and Professor Bakken. The first meeting of the Board was called on Armistice Day, November 11, 1948. It was decided at this meeting that the whole structure of the organization should be overhauled to obviate weaknesses and limitations we had discovered in the first years of its operations. Accordingly, the limited personnel 6f the Board worked as a unit. in rewriting the constitution and by-laws of the organization, and it considered problems of management and. reactivation. It was considered essential that we look to the future, far into the future, to build an organization that would survive the vicissitudes of the times and the cyclical disorders effecting our economy. A great deal of time and energy was given to this task requiring frequent meeting and prolonged discussions with many people. Finally, when plans were jelled on a tentative basis so we could meet the Greeks with something tangible, a meeting was called on November 25, 1948 and again on December 16, 1948. Much of the time in these meetings was devoted to explaining facets of reorganization, past experiences, reasons for change and the like. It was an educational task of some proportions, because few, if any, pre-war members were present who were familiar with previous FBC operations. They had simply disappeared with the vanishing years. To many present at these meetings, it was a whole “now ball of wax” and ideas strange to the new crop of fraternal members. As an aside, the old board members were taken by surprise in encountering open hostility from fraternity members at this series of meetings. It was learned later, that much of the flak was inspired by local merchants who feared they would lose valuable fraternity accounts if FBC was reactivated. At the December meeting, the Board began negotiating with candidates available for the manager’s position, and it was decided that we would hire a full time manager. On January 12, 1949, it was definitely decided to reactivate FBC, and 12 members signified their willingness to join. Unlike the initial venture, no sororities came forward to be a part of the organization in making FBC a viable force in purchasing power on the campus. The winning of these groups is another story best told by our managers who waged a long and patient campaign to win them over to our way of doing business, and now they number among our staunchest supporters. When FBC was originally conceived, it was founded on the ideal of a strict non-profit association. The plan of financing was the simplest imaginable scheme possible for raising operating capital, and accumulating a reserve fund to meet delinquent accounts. 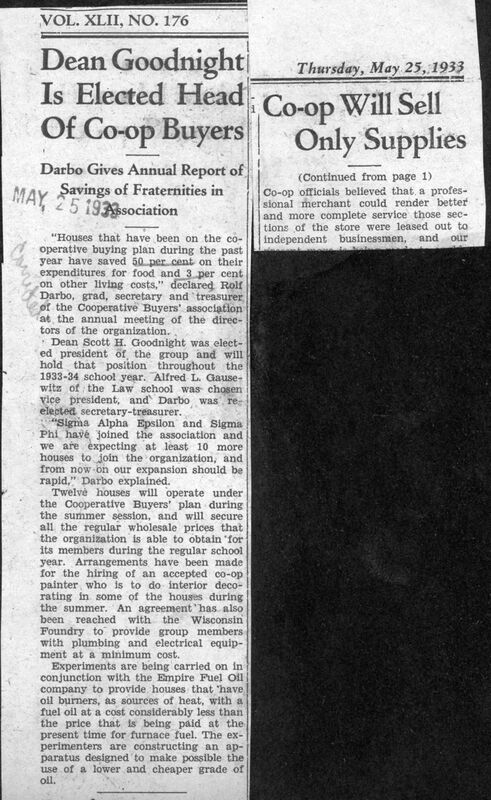 Each member house was required to deposit $40.00 to attain membership. Twenty dollars of this sum was to be used as working capital, and the other twenty dollars was set aside as trust fund to be credited to each member. The trust fund was intended to be drawn on in the event any house member became delinquent in paying its bills to the association. Actual operating costs were to be covered by adding current actual costs to current bills. 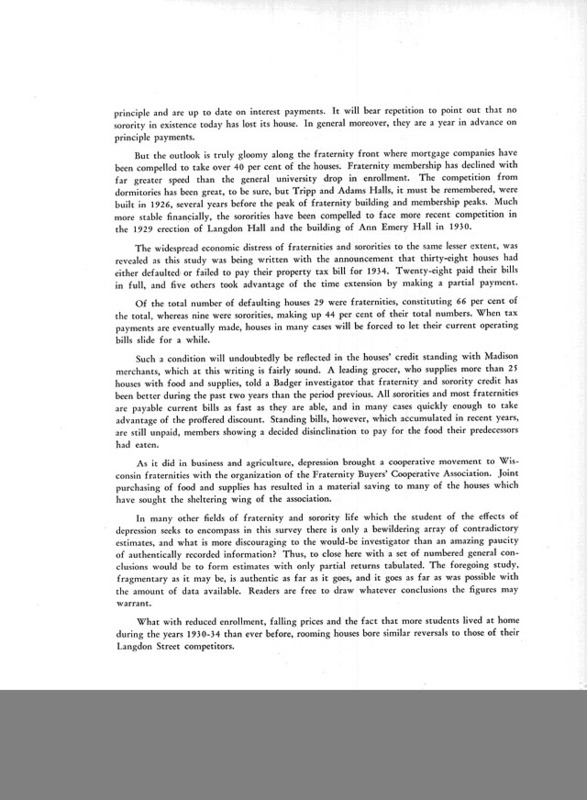 In addition, a small percentage based on each billing was collected monthly until the trust fund reached a total of $15.00 per each individual member in each house, i.e., if a house had 50 members, the trust fund would be allowed to accumulate until it reached an aggregate of $750.00 from that fraternity. Thereafter, no additional amount would be levied unless the house dissipated the fund in some degree or added additional members requiring an increase in the trust fund commensurate with the number of individuals in the member house. It was soon apparent in later years that this meager fund was entirely inadequate to give full assurance to merchants that their current accounts could be met promptly in the event of an economic shakedown. What is vastly more important, the old trust fund fell far short of protecting member houses from having to defray delinquent accounts incurred by other members. 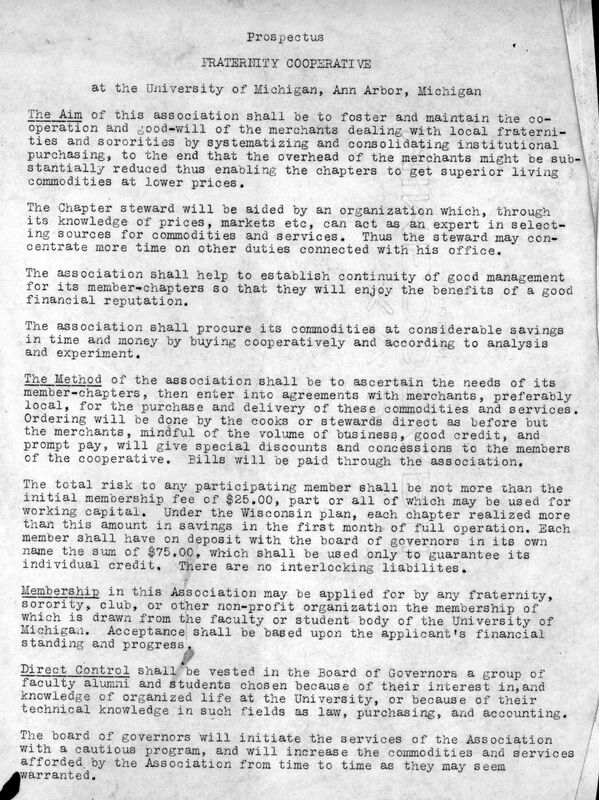 The capital structure was insufficient to provide mutual protection within the association as formed in 1932. The relative values of the depression years, when the organization was first set-up, had (for all intent and purpose) evaporated. Consequently, the total sum of reserves and working capital accumulated during the first decade of operations was not impressive. Fortunately, this capital was left intact in the treasury as a “grubstake” for reactivation, but it was barely sufficient to regenerate organization for the short period of operation before the new FBC began to induct income of its own. The only feature from the original fund raising plan retained was the membership fee of $20.00 for each new applicant. The advance payment of ‘420.00 for operating capital was discarded. Limitations in the original plan for financing were so evident that the Board of Governors was determined to emend procedures for creating a new revolving capital fund and to “beef-up” the Old Trust Fund. 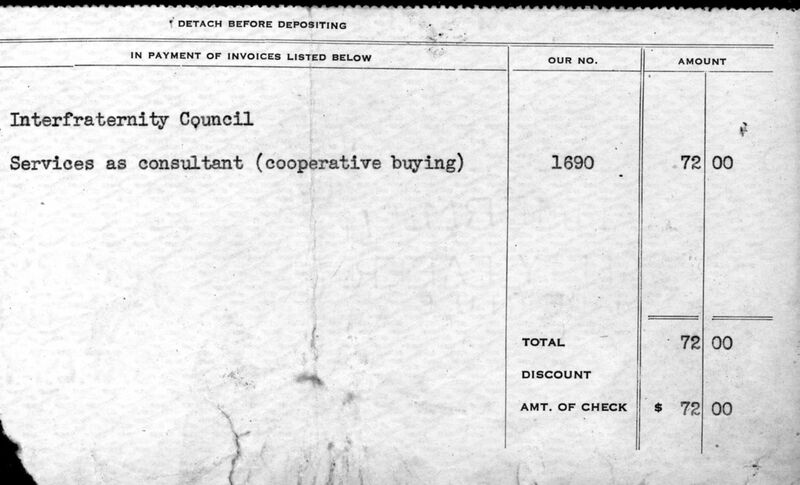 The first decision made was to require the tradesmen to give a discount on their bills at the end of the nay periods if accounts were settled within specific time limits. These discounts varied according to the nature of merchandise delivered all the way from zero to 15% of gross. From this income one per cent was diverted into a guarantee fund and credited to each house in direct proportion to its purchases. Another one percent was siphoned off into the general fund to defray operating expenses. In the years following 1948, the actual cost of operations fluctuated around three quarters of one per cent. At the end of the year, the residual income was paid to the members as a patronage dividend thus retaining the non-profit principle of a cooperative. The withdrawals that had been made from the old Trust Fund to defray the expenses incurred in rejuvenating FBC were repaid. Eventually, the old Trust Fund was liquidated by refunding to each fraternity its equity in the fund. Some members elected to receive cash on the “barrel-head”, and others simply instructed our Treasurer to divert their share toward fattening the new Guarantee Fund. The old system of billing each fraternity for direct operating expenses was abandoned. The new procedure obviated the necessity of billing houses for current operating expenses. 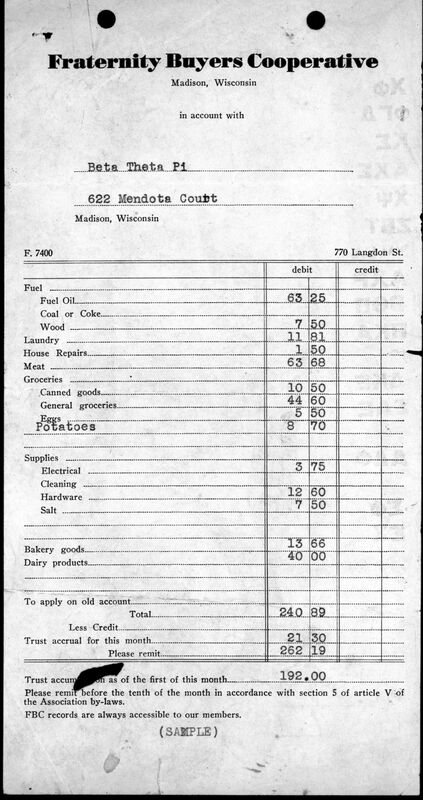 The income from the discounted bills earned by prompt payment of accounts to merchants “paid the freight”. For good measure, it continued to build the guarantee fund into a sizeable sum which has not only given FBC financial stability, but a persuasive bargaining leverage in securing services and quality merchandise at competitive prices. The formulators of this plan provided that the Guarantee Fund would be governed by the Board of Governors, and from time to time its administration has boon slightly modified by action of the Board. Originally, it was anticipated that the Fund should be permitted to grow to substantial proportions for reasons better known to the alumni. Down through the years, one fraternity or sorority after the other has had to take “hat in hand” and go begging for funds to build, buy or buttress its moorings. Failure in these campaigns has resulted in the downfall of many commendable social organizations unnecessarily. The need for funds in sustaining FBC as a viable institution has far exceeded the calculations of the ones who planned this financial structure. As a result, the management has had to utilize the guarantee fund from its inception as operating capital. This was not the intent of its founders excepting instances of emergency. The Guarantee Fund has been built to its present proportions actually at no cost to the member houses. The existence of FBC since 1932 consistently has made available to its members better services and quality merchandise at lower prices than could be obtained by non-members. The proof of this statement lies in the fact that the sororities and fraternities are now unanimous in their support of FBC on the Madison campus. If the time has come, through misconception, that the Guarantee Fund should be frozen in growth to a specific level, and the Board approves such action, then it is suggested that FBC create an alternate “kitty” which might be labeled “Provisional Reserve”. This fund’s equity shall remain in the Treasury of FBC as a collective sum and be regarded specifically as social capital as distinguished from private, corporate, or group capital. This Provisional Reserve Fund will Agglomerate from deducting two percent from merchants discounts. One-half of one percent shall continue to be diverted to the guarantee fund for all members who have not attained the predetermined level of growth. One and one-half per cent shall continue to be diverted toward defraying the over-head costs of FBC. This change will make it necessary to demand of merchants a 4% discount in substitution of the 3% previously imposed. This change can be logically defended since all costs of operation have risen out of proportion to those anticipated when the original plan of financing was conceived.